Join us downtown at St. Lawrence Market on Saturdays throughout the summer from 10 a.m. to 2 p.m. as we take our educational programs ‘on the road’. Look for our booth on Market Lane near the fountain. Demonstration use of edible plants in ornamental containers. Activity: Make your own ornamental edible container with a pairing of vegetables, herbs and flowers. Demonstration worm bins, worm trays and magnifying glasses. Activity: Newspaper ripping, veggie chopping and feeding. Soil harvesting activity using either a sifter or a lamp. Demonstrating growing berries in containers; strawberries, haskap, blueberries. Activity: Propagating ever-bearing strawberries from cuttings. Demonstration hive & bee equipment. Activity: honey tasting and planting basil seeds in peat containers to attract pollinators. August 10: Eat Your Flowers! Demonstrate various edible flowers to add to your gardens or containers. Activity: Plant edible flowers or veggies to keep the garden growing indoors as the summer winds down. Make up seed packets to get ready for next year. Demonstrate with used gardening books. Activity: ‘TBG Buttonicals’. 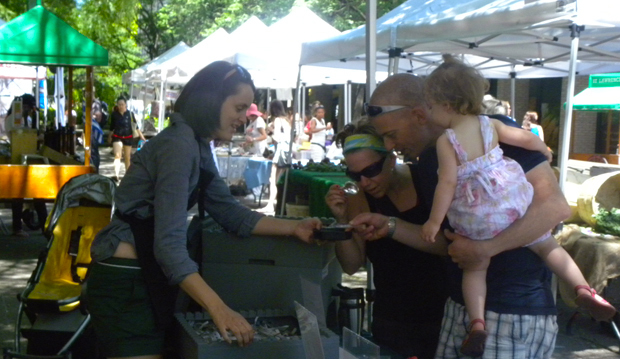 Use TBG’s button maker to make your own buttons from used books on fruits and vegetables. August 24: Pea Shoots, We Score! Demonstrate examples of growing your own sprouts and micro greens all year long. Activity: Planting peas in berry containers to grow your own indoor pea shoots.